Yes, fellow Tolkienites, you read right. There exists a city in this world called Bilbo, and it’s as awesome as the name. 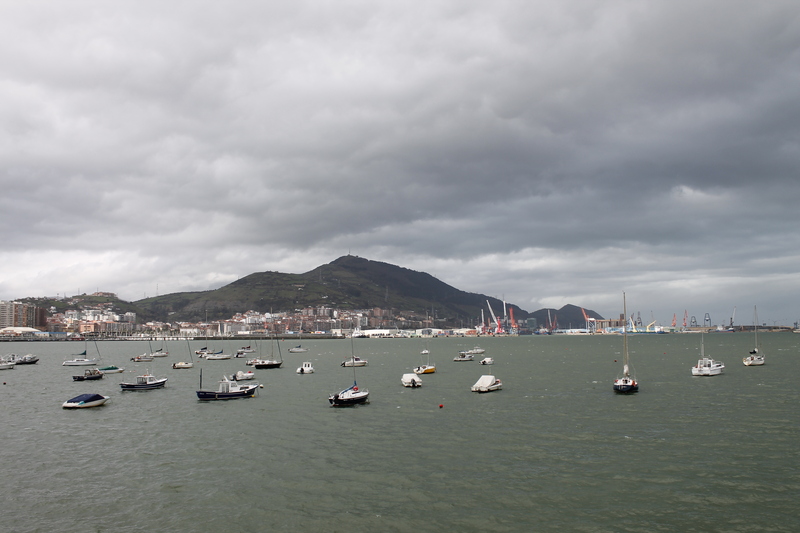 Located in the north of Spain in El pais vasco (Basque Country), it’s known more widely as Bilbao, but Bilbo is the name in Basque, the local language. The important words to know. Bilbao itself is a small city of 360,000, nestled in the mountains and the shore, making for some truly beautiful views. The landscape is also very different; I was amazed by the unreal green of the grass and trees, and as we flew in we were able to see the dramatic land-forms and rifts, getting a feel for the entire area. 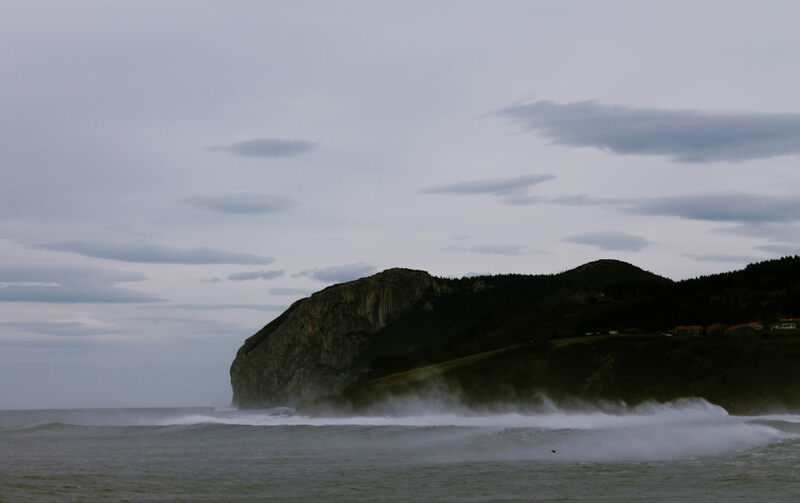 Many people jokingly say that in Basque Country, you aren’t in Spain, and it’s not just because of the landscape: it has retained its strong cultural identity despite becoming part of Spain. It’s true that Bilbao felt very different from Madrid for many reasons. There is a tremendous amount of Basque pride and nationalism, stronger in the Spanish side than the French side, to create a separate country. They have some pretty good reasons too beyond their cultural heritage: the Basques are doing pretty well for themselves, with the highest per capita income and lowest unemployment rate in Spain (around 14%, while Spain’s overall is a disturbing 26%). Probably the most well known nationalist organization is ETA, an armed group that has been labeled as a terrorist organization by the EU and the USA (although in 2011 they announced that they were going to stop using arms). THAT BEING SAID now I’ll reveal that I have Basque ancestry, and not even too far back: my great-grandfather was Basque and my grandmother still has a Basque last name. I definitely got some genes from that side of the family: every time I meet someone here they say I look Spanish, and seeing all the dark haired and eyed Basques, I could easily see how I inherited that, because it certainly didn’t come from my Austrian and Hungarian side. Not to mention that I’m a strong-willed, opinionated and proud person, so maybe I got some of that from these headstrong northerners. Or maybe I’m reading too much into it, but in any case, the trip held an extra element for me. I normally don’t advertise the fact that I’m part Spanish since it seems like so many Americans love to cry the second they meet someone from a distant part of their heritage, “OMG I’m Irish/Italian/German/etc too!! !” about a million generations back, with no connection to the culture. 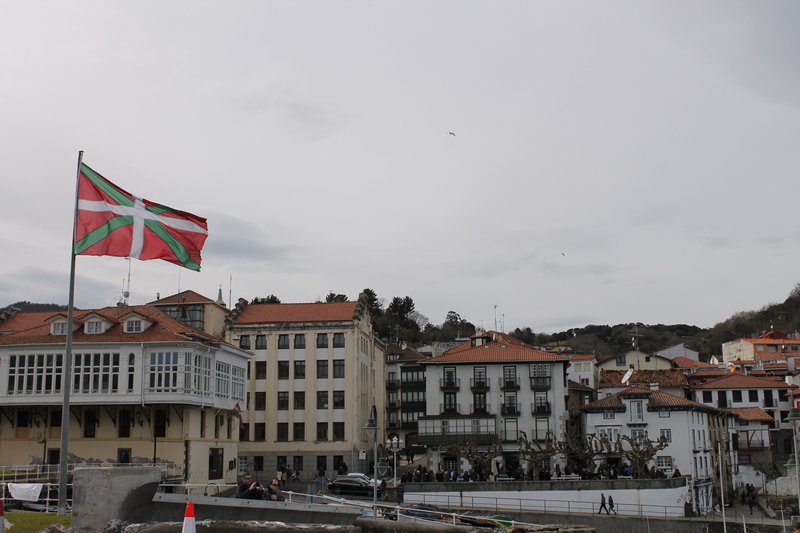 I don’t feel connected to the Basque culture at all, nor do I fluently speak Spanish, which is why I don’t feel like I can say I’m part Basque because I don’t feel it, so I only mention it if the subject comes up. 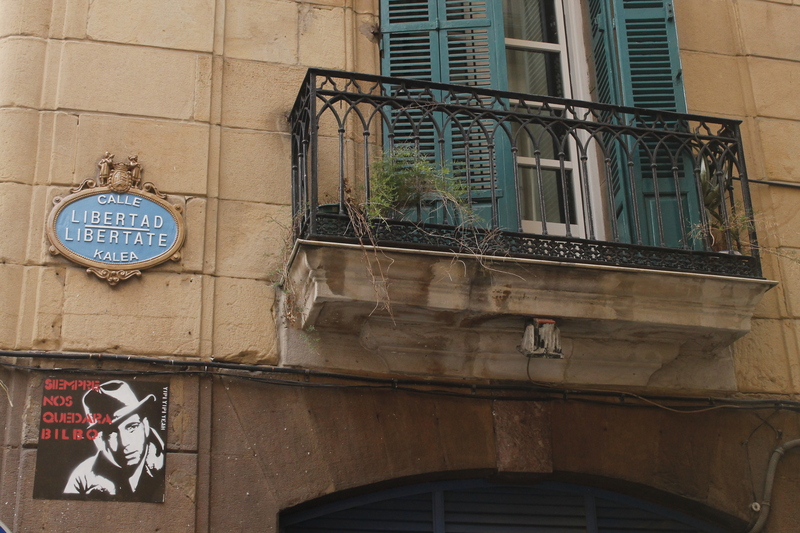 But being in the Basque Country definitely sparked a desire to discover more about that part of my family, and really what made me start Spanish in university in the first place was to connect with that side of my family (I tried German, and Hungarian, man I wasn’t even gonna go near that). 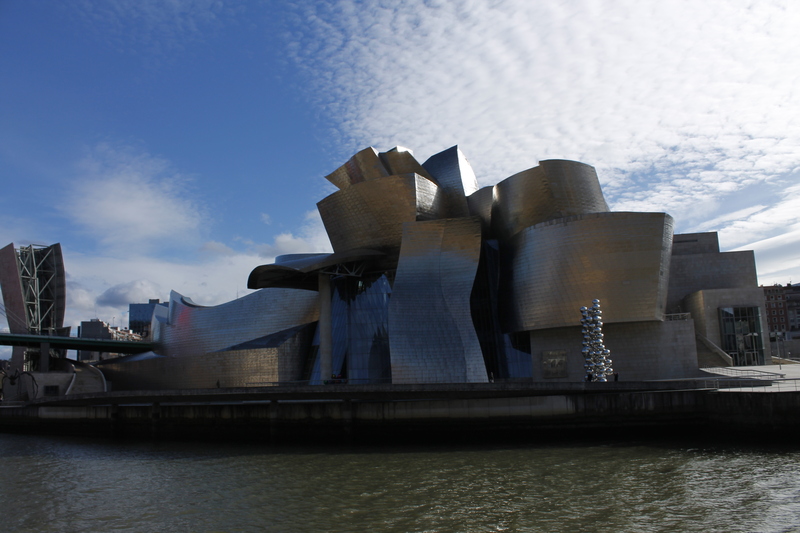 Turning back to Bilbao, these days it’s most known for the Guggenheim, an art museum housed in a crazy building designed by Frank Gehry. One of the 12 Treasures of Spain, it was on our top list of things to do while in Bilbao, but actually we never ended up going inside. Half of it was closed and we chose to spend our time on the coast, a decision which I do not regret in the least. Art museums aren’t really my thing, and I can go when I return to Bilbao for the Camino de Santiago. But anyway, the outside of the building is pretty cool. Food was another reason I was excited to go to Bilbao, all I kept hearing was how tasty it was; and it did not disappoint. The food is delicious and fresh, full of seafood dishes and delicious white wines to accompany them. A dish that we kept turning to was rabas, aka calamari, but so much more light and tasty than any I had ever had. 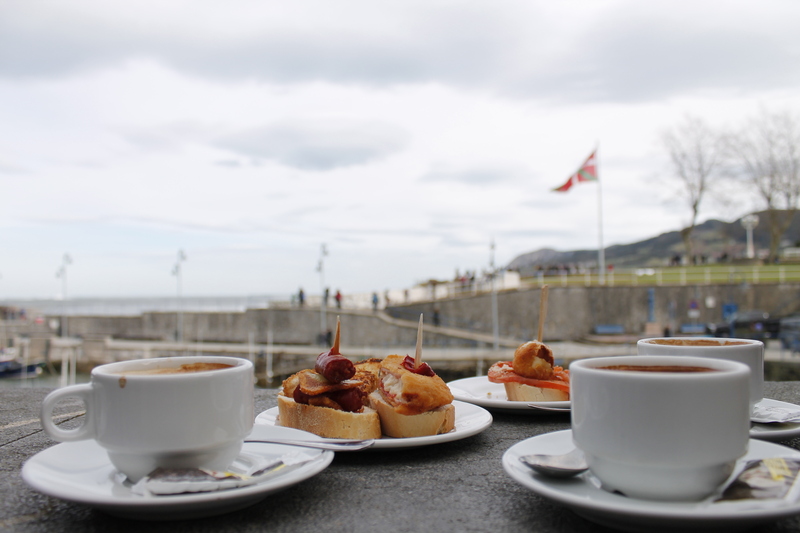 Tapas are called pinxtos , and the best way to experience a night in Bilbao is to bar hop for a pintxo in each one. If you head out of the bar with your glass of wine and mill in the street with the rest of Bilbao, you might even get to experience some local culture like we did in the form of a traveling group of Basque people singing traditional songs and meandering through the Old Town. I sadly didn’t get any photos, as my camera phone is completely dysfunctional in the dark and I don’t carry around my nice camera at night. Ah well, next time! But the true magic of Bilbao lies the surroundings. I’m not used to mountains so close to cities; whenever I see the Madrid mountains from afar I’m amazed, and they’re not even blanketed in an unreal green like those in the Basque Country. 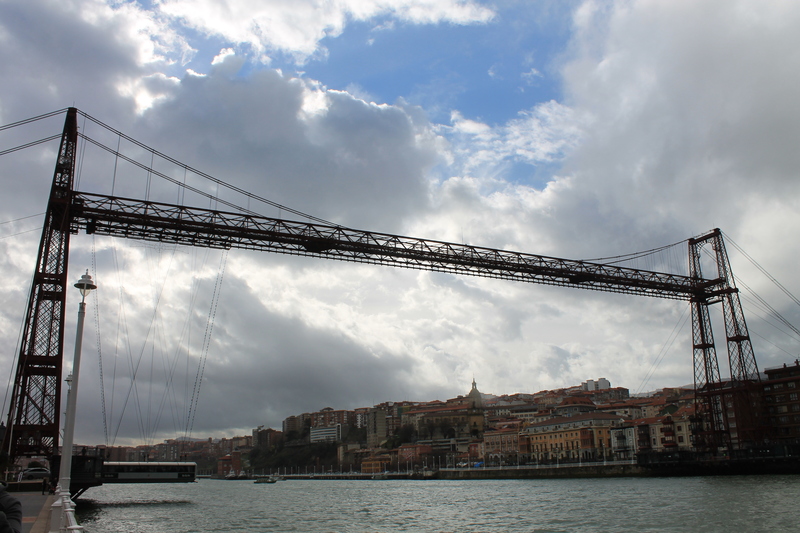 Saturday we headed to the UNESCO listed Vizcaya “Hanging” Bridge, an interesting site to see as it’s a bridge that functions unexpectedly: by transporting cars and people in a hanging chamber! Of course we giddily traveled across and walked along the water until hunger overtook us and we stopped for some rabas. That little pod on the left is what moves across! 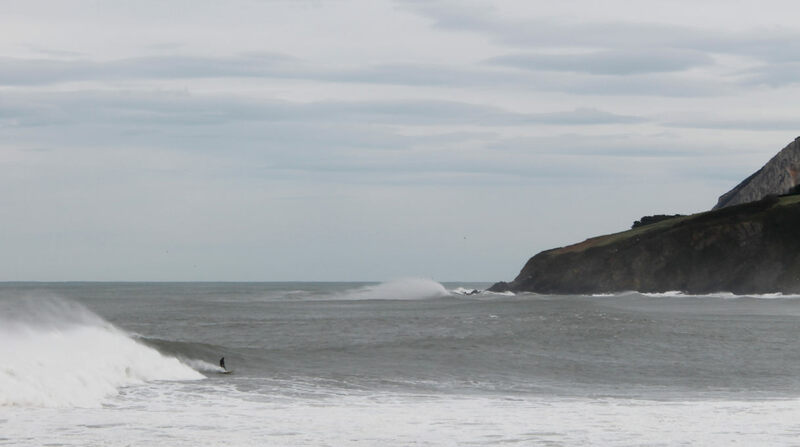 Sunday’s coast destination was Mundaka, internationally renowned for it’s surfing scene, where the waves are perfect 1/3 of the time and people are crazy enough to surf even in February. The coast was savage and wild, the February winds stirring up huge waves that tumble and crash with enough force to bring down a break wall (not while we were there, but we saw the aftermath). The mist rose above the water like wraiths, swirling and lingering in the air until plunging down into the hungry sea again. We all stood for a solid half an hour on the outermost point staring into the tempestuous water, lost in contemplation, overwhelmed by the immensity of nature until the bitter cold forced us to head onward to a nearby fishing town and cup of hot caldo, or broth. I had noticed that every bar and restaurant was advertising Hay caldo, saying that they offered it. What’s the big deal about broth? I wondered, until I wrapped my non-functioning fingers around a two-handled bowl and experienced the warming properties of a bowl of hot caldo, inside and out. Because it wasn’t a boring old chicken broth; each bar/restaurant has their own recipe and the one I had just the right amount of hint of seafood to be tasty without overwhelming. Where has natural beauty blown you away? Have you ever reconnected with a part of your family’s history? I had no idea it was actually called Biblo….and in your title I didn’t even notice you spelled it like that! haha. I ALSO have some Basque ancestry (says my Salvadorian grandmother, but that’s all I know) but I’m sure you are much more Basque than me! 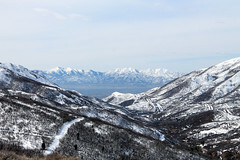 I need to get there soon, it looks fabulous!